Venison tamale pie seasoned with chilis, green pepper and chili powder. Topped with homemade sweet stoneground cornbread biscuits and baked using high heat. This dish can be on the table in 45 minutes! With the arrival of our second daughter in 2013, a dear neighbor stopped over to see the baby and bless our family with this amazing meal. He called it Tamale Pie because it had green chilis, sweet corn and chili powder. I have since changed out the corn for green pepper, but either version is wonderful. From start to finish, you can have this dish on the table in 45 minutes. 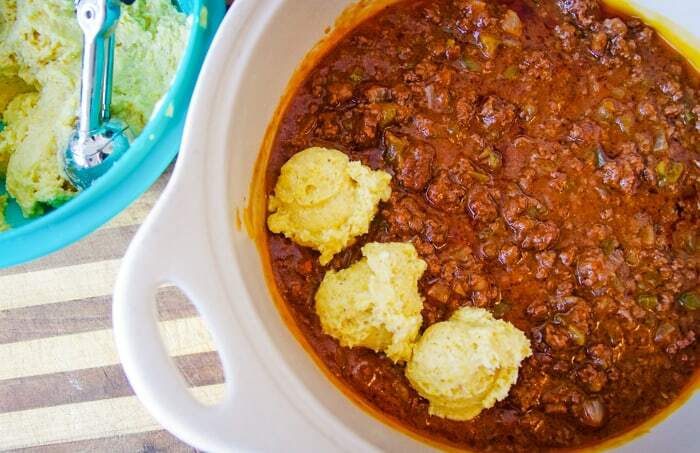 If you enjoyed my Hunters Casserole made with ground venison, you will love this one too! Preheat your oven to 425 degrees. In a large saucepan, saute the chilis, green pepper and onion in salted butter on medium heat until the peppers and onions are translucent. 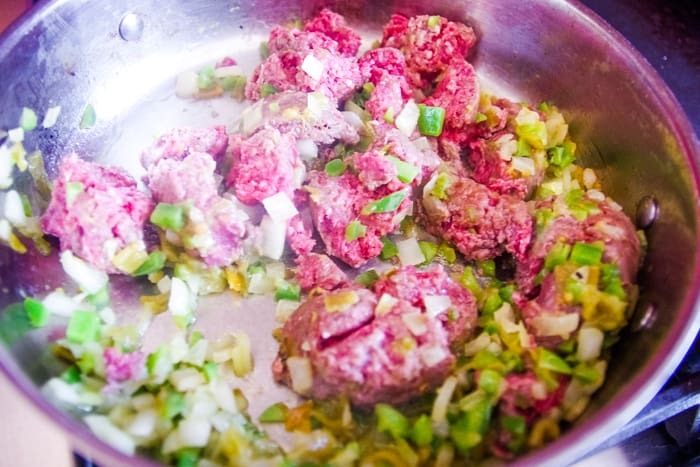 Add your ground venison and chop the meat, cooking it until all the pink is gone. You might have noticed that I’m not removing the peppers first, but that’s because we don’t need to drain the excess fat from the meat. Venison is very lean and what little fat there is will add flavor. Simmer for 5 minutes on low-medium heat after adding 1 can of condensed tomato soup (I like to buy the most natural brand I can find), chili powder, garlic powder, salt and water. 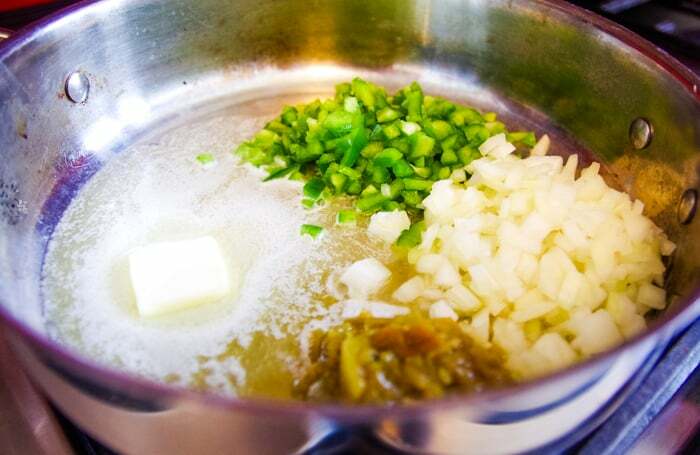 This will become the base sauce of our venison tamale pie. 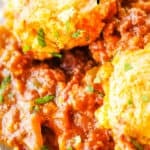 Make the homemade cornbread biscuits which will make the topping for our tamale pie. 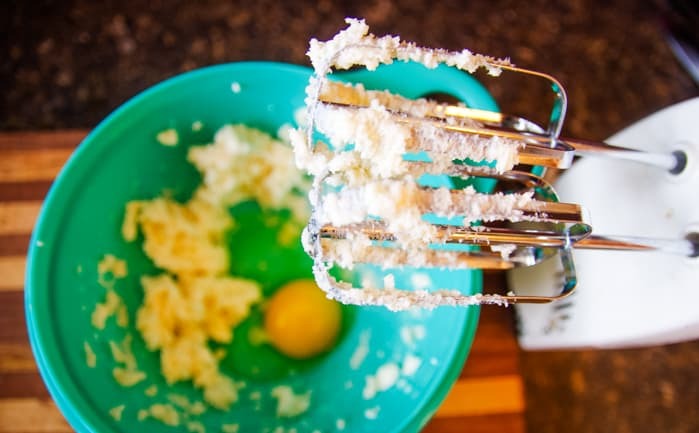 Cream together the butter, sugar, sour cream and egg until well mixed. Stir in the flour, stone ground cornmeal (Hodgson Mill is the brand I use), salt and baking soda. 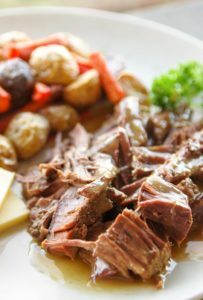 Pour your venison and sauce into a 3 quart casserole dish or deep dish pie plate. Top with 12 large scoops of cornbread mixture. Cover the dish with foil and bake for 15 minutes at 425˚ F. Then remove the foil and bake another 15 minutes until the cornbread is golden and baked through. 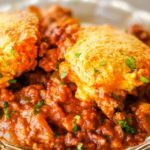 Top the venison tamale pie with chopped cilantro or sour cream and enjoy with the ones you love on a busy spring evening. I like to add a garden salad or favorite vegetable on the side for one complete and scrumptious meal. Bellies will be full and ready for more play…spring is here! 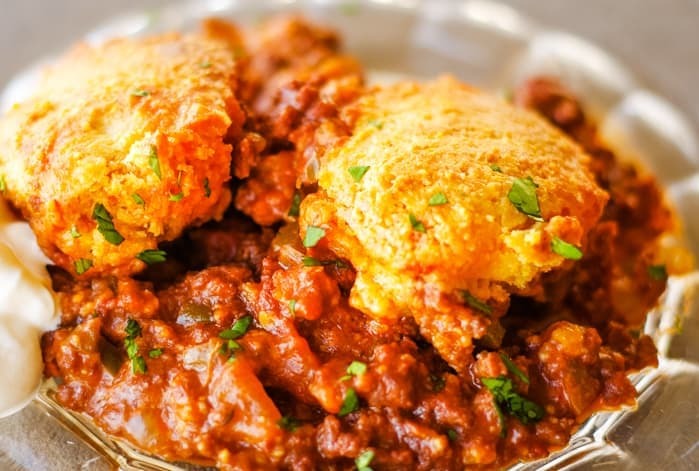 On the table in 45 minutes this venison tamale pie seasoned with green chilis, sweet corn and chili powder and is topped with homemade sweet stoneground cornbread biscuits. In a large saucepan, saute the chilis, green pepper and onion in salted butter on medium heat until they are translucent. Add your ground vension and chop the meat well into the pan, cooking through. Add 1 can of condensed tomato soup, powders, salt and water. Simmer for 5 minutes on low-medium heat. Meanwhile, in a separate bowl, cream together unsalted butter, sugar, sour cream and egg until well mixed. 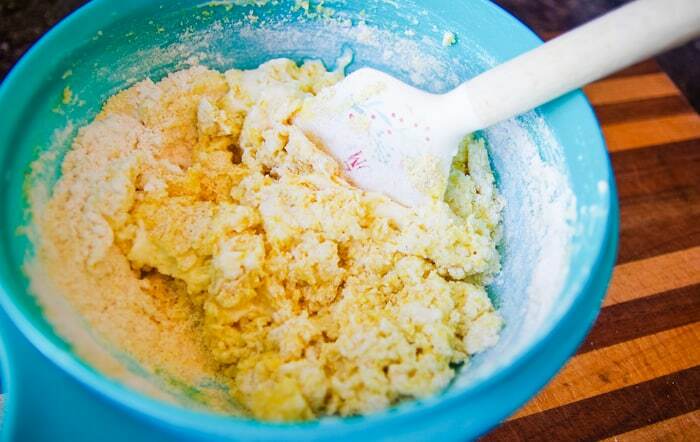 Stir in the flour, stone ground cornmeal, salt and baking soda. Mix well. 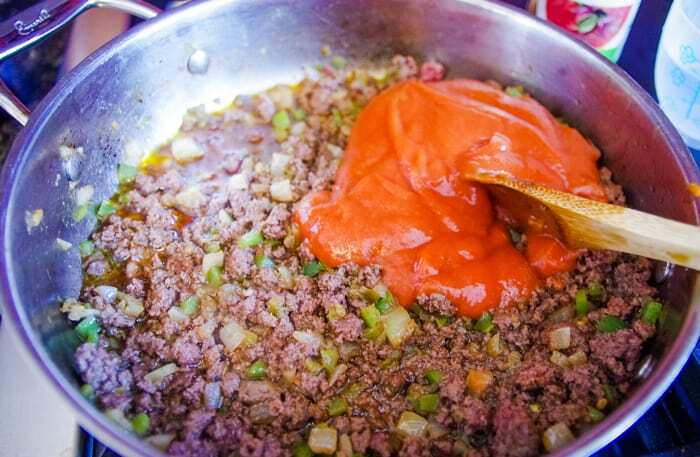 Pour your ground venison sauce mixture into a 3 quart casserole dish or deep dish pie plate. Top with 12 scoops of cornbread mixture. Cover the dish with foil for 15 minutes at 425 degrees. Then remove the foil and bake another 15 minutes until the cornbread is golden and baked through.